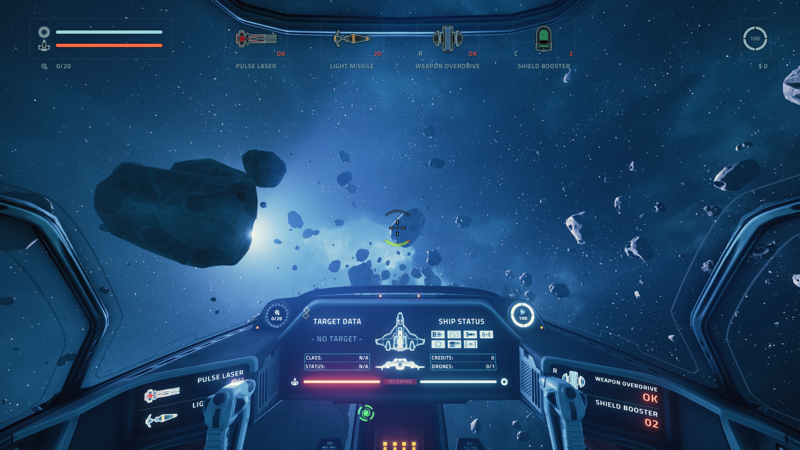 Space exploration with procedurally generated environment alongside space combat and crafting, Everspace sounds a lot like No Man’s Sky but is so vastly different. It is a rouge-lite game with stunning visuals, great control and intense combat this is one of the most fun Space Explorations games I’ve played. And to top it all off, it even has a VR mode so you can immerse yourself even more and enjoy the gorgeous visuals. So let’s get right to the core of the game then. The game has just one mode which also features a story that is told through dialogue accompanied with image stills. You get these story bits everytime you get to a new Sector but that felt secondary to me because of how much fun the game was otherwise. You spawn into an area of the sector where then you must start looting everything in sight before the Okkar show up, who are basically the baddies. After a certain amount of time has passed with you in an area, you get a warning about the Okkar jumping in and if you don’t get out by then, you’re in a LOT of trouble. To get out of an area you have to make a Space Jump which costs fuel and god forbid if you’re low on fuel. If that happens you can still Jump but with a risk of badly damaging your ship, but if you’re in that much of a hurry to Jump to get away from the Okkar and certain death, the risk is worth it. There are other Outlaws and Okkar drones and scouts flying around as well before the “Big Bad Ship” shows up that you can either engage and kill or avoid. When you do make your first jump, you get an FTL map that allows you to choose the route you want to take and once you get the upgrade, allows you to see the threat levels. You have a choice of weapons which include two Primary and one Secondary alongside Rechargeables and Consumables to aid you when you start. You can upgrade to get more slots for these weapons and unlock other weapons and weapon loadouts as well. Every run that you make gets you “Credits” which you then use after the run to either get upgrades or buy a new ship but the catch is that you cannot save up credits, which means you gotta spend it or lose it. The upgrades don’t’ feel like a huge upgrade but are more granular so you don’t feel the impact of it immediately, which felt offputting to me. Alongside upgrades, there are two other ships that you can purchase, one a lightweight stealth fighter, the other a heavy gunship with no shields. These ships have their own upgrades and perks as well. 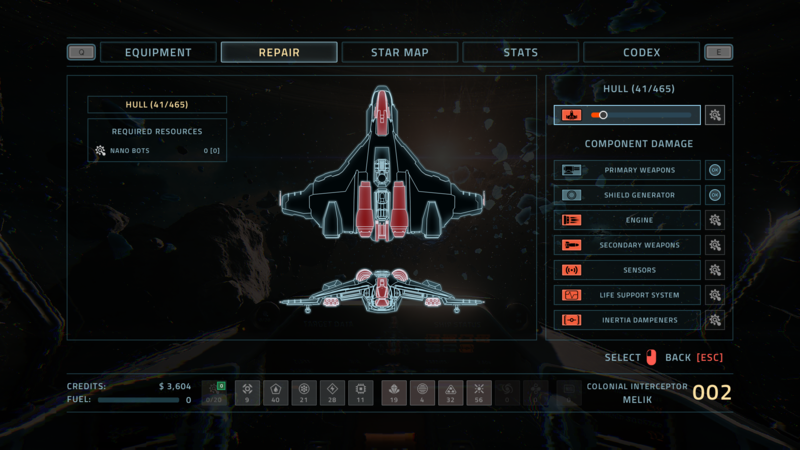 Exploring gives you credits, items for your ship so that you can fix it or upgrade your weapons while in flight and to repair your main systems in case they get damaged. Fuel, however still is the biggest commodity because of the above-mentioned reasons of needing it to make the Jumps to new areas. The areas are procedurally generated so every run is different which means you can’t just memorise things. You can hack a comm station if that is there in the area to give you information about the whereabouts of items in that area. 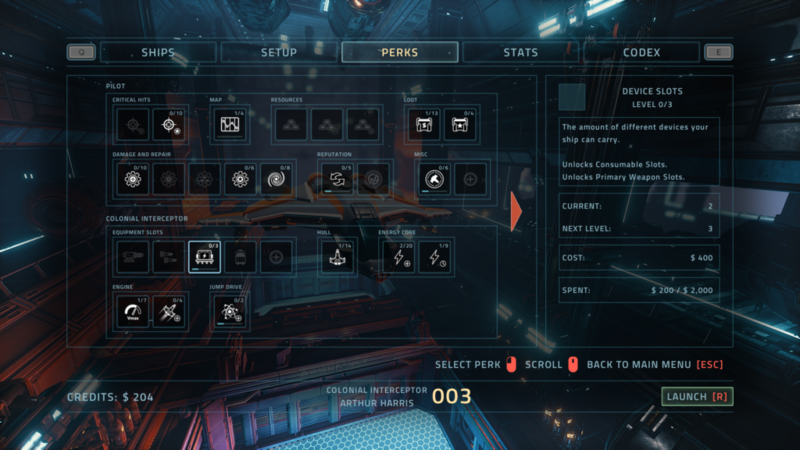 There are also special areas that need “Access Keys” to get to, Keys which are found as bonus starting perks, purchasable from traders that you might find or by downing an Elite ship. The chances of an Elite Fighter spawning is very low on Easy but that increases with the difficulty. There’s also challenges that net you extra Credits upon completion which basically gives you a task to complete just to give you that sense of accomplishment in a game that’s all about dying, upgrading and dying again. Visually, the game is stunning. It looks so damn good that I genuinely had to stop and look at how great it was and had me use the Action Freeze Cam a lot to take screenshots. The cockpit inside is also highly detailed so you can read everything with ease which sure as hell made my life easier. And the silence of space is broken with beautiful music that just randomly plays and adds a lot to the whole feel of it before slowly fading out to the silence of space. The game has one big caveat though, the lack of HOTAS support. For a game that’s all about flying in space and shooting things in space, the lack of HOTAS support is a bummer. The gamepad controls aren’t that good and the developers actually recommend using the Keyboard and Mouse, which quite honestly wasn’t that bad. The controls are simple and aiming wasn’t an issue. 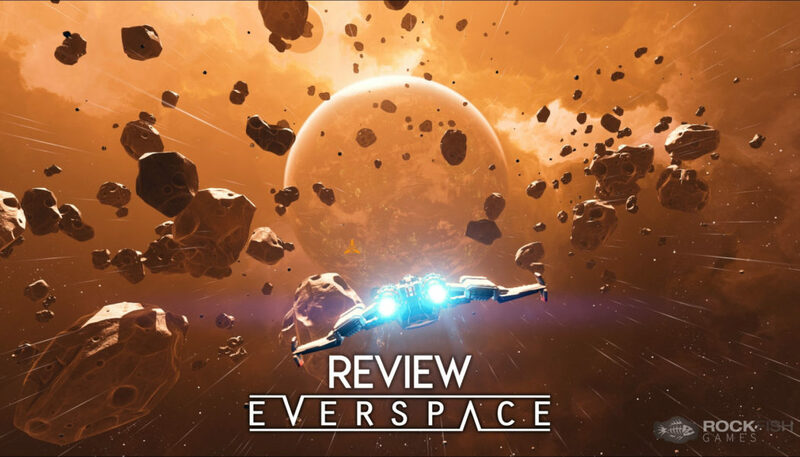 Everspace is a fun space themed Rogue-lite game with breathtaking visuals and a decent soundtrack. If you want a fun game that’s in space and allows you to fly around and blow things up while also making you feel vulnerable, this game might be for you. 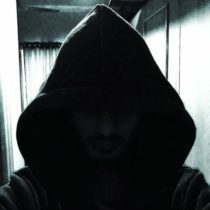 That being said, the game is now out of early access with a lot of updates being pushed out and much more planned. I look forward to seeing how they improve and polish this game and what all they add to make it more fun. 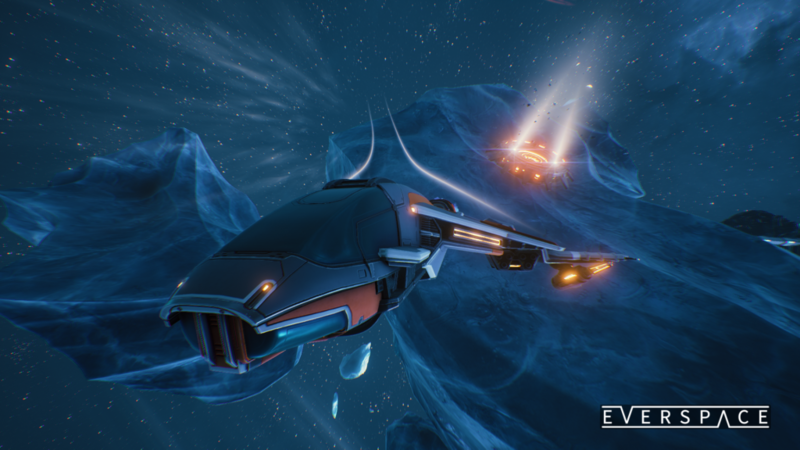 Everspace is being developed by ROCKFISH games and is now available on Steam, PS4 and Xbox One.